Celebrating the first Fall 2009 Happy Hour! 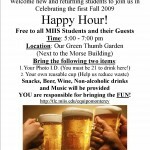 Student Council & Team Monterey El Salvador would like to welcome new and returning students to join us in celebrating the first Fall 2009 Happy Hour! YOU are responsible for bringing the FUN! Please note: One nomination per person (one person can be nominated for more than one position, BUT can only run for one position in the elections). Please direct all questions to Student Affairs. Student Council and The Food Bank of Monterey County greatly appreciate your participation. Please contact David Reichbaum, Chris Hucke, Seda Sevas or Student Affairs for details. Announcing the 2008-2009 Student Council! We are currently accepting nominations for the following Student Council positions: First year class representatives, Vice President and Secretary. You can stop by the Student Affairs Office and nominate yourself or a fellow classmate. The deadline to nominate someone is Friday, September 12th. Nominees will present their speeches on Tuesday, September 16th from 12-2pm in the Holland Center. Voting begins at NOON on the 16th and concludes on the 19th at 5pm. Stop by the Student Affairs Office to vote!